Try something different with fresh British cherries during their short summer season. This Moroccan-inspired spiced pilaf is a clever one-pot recipe, filled with juicy cherries, tender lamb and spinach for a simple family dinner. Heat the oil in a large lidded pan over a medium-high heat. Season the lamb and fry for 6 mins or until browned all over. Transfer to a plate; set aside. Reduce the heat and add the butter to melt. Tip in the onion; cook for 8 mins to soften. Increase the heat and stir in the spices; cook for 1 min. Add the rice, half the cherries and the seared lamb; season. Pour over the stock, bring to the boil, then cover. Reduce the heat; simmer for 12-15 mins until the rice is tender and the stock absorbed. Stir in the spinach and let it wilt. 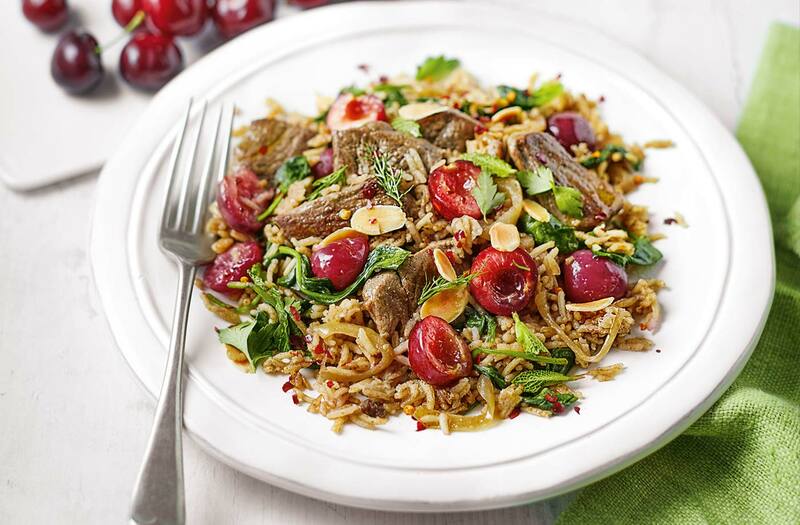 Sprinkle over the chopped herbs, remaining cherries, flaked almonds and crushed chillies to serve.